Citizen made their first true Chronometer in 1962. 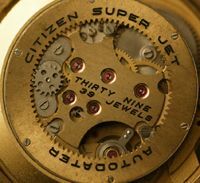 It was a handwinding model with a unique 31 jewel movement, and Citizen’s desire to create a special watch left profitability a low priority. It is a very expensive piece these days – it was in production to around 1967/68 when the Chrono Master line was launched with both hand-winding and automatic models. The Chrono Masters were themselves replaced by high-beat movements around 1970/71, although production overlapped. The high-beat – i.e 36,000 beats per hour – models had two chronometer grade models, the ‘Highness’ and the ‘Glorious’. The latter is a very rare piece, and, again, is very expensive nowadays. I have previously referred to the ‘Leopard Chronometer’, but my research into this article has led to the conclusion that this was also known as a ‘Highness’. 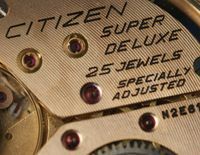 Although it had no such name on the dial, and featured unique logos on the dial and case back, it is described in Citizen’s catalogs and advertising as a Highness. There were two other chronometers in the late 1960s / early 1970s line-up, which were 25 and 19 jewel versions of the X8 electro-mechanical watch, a short-lived hybrid design that was soon rendered obsolete by the rapid development of quartz technology. 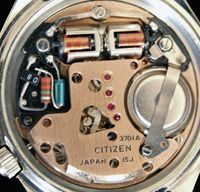 I believe that Citizen used its own in-house standards for their chronometers at least prior to the creation in 1968 of the Japan Chronometer Inspection Institute (JCII). However, it seems to me from my research that Citizen incorporated Swiss standards, at least in part, as applied by the Bureaux Officiels de Contrôle de la Marche des Montres (BO) in their own standards. The BO standards from 1955 to 1961, then 1961 to 1973 appear to be reflected in Citizen’s own. In 1973 revised standards were applied in Switzerland and Europe when the BO came under the Contrôle Officiel Suisse des Chronomètres (COSC), the official Swiss testing institute, but by then the JCII was in place. I have found reference to the JCII being admitted to the International Chronometer Certification Committee (CICC) in September 1969. Therefore, it seems logical that from that point onwards, ‘Officially Certified’ chronometers met the international standard. The following table shows the three standards used by Citizen for their mechanical and electro-mechanical watches, described as ‘Standard Class’, ‘Excellent Class’ and ‘Glorious Citizen Class’. Although chronometer standards cover a range of measurements (see below), the usual one line summary that is used is the ‘Mean Daily Rate’ (MDR). In 1955 the MDR standard applied by the Swiss BO was -3.0 ~ +12.0, and from 1961 to 1973 MDR was -1.0 ~ +10.0 seconds. 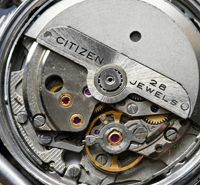 These can be seen under Citizen’s Standard and Excellent classes, whilst Citizen made what was their ultimate high end piece, the Glorious, to a special level of accuracy. 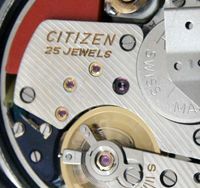 The 1961 BO standards exactly match Citizen’s ‘Excellent’ class, which would suggest that watches marked by Citizen as ‘Officially Certified’ achieve or exceed this level of accuracy. There are three models that are not marked as ‘Officially Certified’ but are in the Excellent Class, namely the 1962 Chronometer (movement 0400/0401), the Highness (movements 7230/7430/7730/7740) and the Glorious (movements 7750/7400). We can see that the latter had its own special accuracy classification, whilst I have seen references to a ‘Highness Standard’ (typically mis-translated as the ‘Haynes’ standard). Catalogues, advertising and reference material indicate that this was the ‘Excellent’ grade. As to the Chrono Masters, the ‘basic’ models, i.e. those marked simply ‘Chrono Master’ and ‘Chronometer’ are standard class chronometers (movements 0920/1870/5240/5440/0802[X8]), except for the 0920 and 1870 18K solid gold models which are marked ‘officially certified’. Those marked ‘Officially Certified’ or ‘Special’ or ‘Superior Chronometer’ are excellent class (movements 0930/5250/5450). The X8 ‘Officially Certified’ model is excellent class (movement 0821). 2. Mean Variation, or mean daily rate variation in 5 positions. This test is sometimes referred to as rate deviation. The COSC observes the movement’s rate in the 5 positions each day over 10 days for a total of 50 rates. It is said this measurement shows the quality and reliability of a watch – a good quality watch will be consistent, whether it is fast, slow or correct. The disadvantage of a consistent error is that it accumulates. If the watch is 10 seconds fast every day, it will be over a minute fast at the end of a week. However, a watch that is consistent is more easily regulated, and so the error is more easily eliminated. 3. Maximum Variation. This is the largest difference between any two day’s readings in a single position. 4. Difference between flat (horizontal) and hanging (vertical) positions. The figure is calculated by subtracting the average of the rates in the vertical position (first and second days) from the average of the rates in the horizontal position (ninth and tenth days). Some experts feel this test shows the greatest difference between mass produced and hand adjusted movements. This figure tends to be lower for better quality movements. 5. Greatest difference between the mean daily rate and any individual rate. This is the largest difference between the mean daily rate (the figure reported in test number 1) and any individual rate during the first 10 days of positional testing. 6. Variation of rate per 1 degree centigrade. This is the temperature error of the movement, expressed in seconds per degree. The COSC subtracts the cold temperature rate (8 degrees) from the hot temperature rate (38 degrees) and divides by 30. 7. Rate Resumption. This figure is obtained by subtracting the average mean daily rate of the first two days of testing from the mean daily rate of the last test day.